Pupation occurs in the soil. 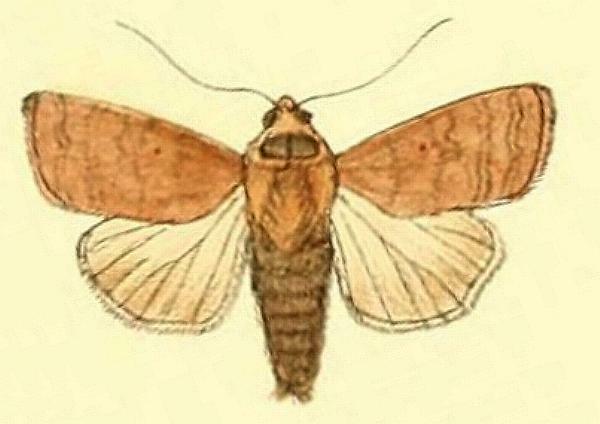 The adult moth of this species has speckled pale brown forewings, the male having an orange area near the base. There is a narrow pale submarginal line on each forewing. 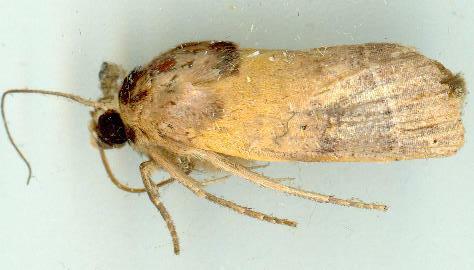 The hindwings are off-white with brown veins. The wingspan is about 2.5 cms. The eggs are hemispherical, ribbed, and green, with a red tip and a red ring around the middle. L. Reeve, London, Volume 3 (1886), p. 31, and also Plate 148, fig. 4.